False Advertising, originally uploaded by HexBlock. 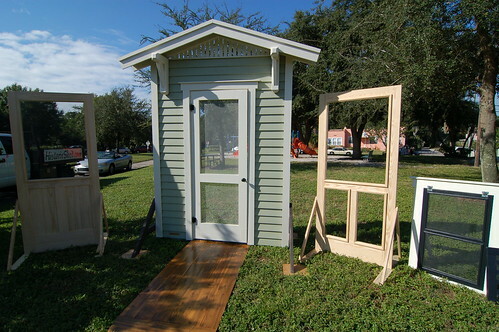 During a recent web search we were pleased to find this great photo of our HistoricShed.com display at the Historic Kenwood Neighborhood Home Tour in St. Petersburg, FL. While we didn’t get a chance to go into any of the featured tour homes, we met a lot of great historic homeowners and enjoyed a gorgeous day in a lovely park. If you haven’t had a chance to see this great National Register listed neighborhood, you have been missing out. As for the display, we were showing off examples of our traditional screen door designs, wood window screens and foundation lattice, along with our shed products. Bringing an entire shed tends to be a bit much for a one day show and can be detrimental to Park grass, so this is our standard “show” setup. We still haven’t decided whether the photographer was impressed or dismayed based on his title and caption, but love the photo either way!